Composite video is a method in which the Color, B/W, and Luminance portions of an analog video signal are transferred together from a source to a video recording device (VCR, DVD recorder) or video display (TV, monitor, video projector). Composite video signals are analog and typically consists of 480i (NTSC)/576i (PAL) standard definition resolution video signals. Composite video, as applied in the consumer environment, is not designed to be used for transferring high definition analog or digital video signals. It must be pointed out that composite video is not the same as RF signal is transferred from an antenna or cable box to a TV's RF inputs using a Coaxial Cable — the signals are not the same. RF refers to Radio Frequency, which are signals transmitted over the air, or relayed through a cable or satellite box to the antenna input connection on a TV via a screw-on or push-on coaxial cable. Connectors used for transferring composite video signals come in three types. For professional use, the main type of connector used is BNC. In Europe (consumer), the most common type is SCART, but the most common type of connector used on a worldwide basis is what is referred as an RCA video connector (shown in the photo attached to this article). The RCA type of composite video connection cable that is most commonly used has a single pin in the center surrounded by an outer ring. The connector is usually has a Yellow housing surrounding the connector end for standardized, easy, identification. It is important to note that a composite video connector only passes video. When connecting a source that has both composite video and audio signals, you need to transfer audio using another connector. The most common audio connector used in conjunction with a composite video connector is an RCA-type analog stereo connector, which looks just like an RCA-type composite video connector, but is usually red and white near the tips. When shopping for an RCA-type composite video cable, you might them as single time, but many times, it is paired with a set of analog stereo audio cables. This is because this trio of connections are used very commonly for connecting source devices, such as VCRs, DVD recorders, Camcorders, and more to TVs or video projectors. The composite video connector is the oldest and most common video connection that is still in use. It can still be found on many video source components and display devices, including VCRs, camcorders, DVD players, Cable/Satellite boxes, video projectors, TVs (including HDTVs and 4K Ultra HD TVs). However, composite video connections have been eliminated from Blu-ray disc players, and most newer network media players and media streamers have also eliminated this option. Although still included on most home theater receivers, there are some units that have also eliminated this connection option. Also, on most TVs made since 2013, Composite video connections have been placed in a sharing arrangement with Component video connections (which means that you cannot connect composite and component video sources to many TVs at the same time). S-Video: Same specifications as composite video with respect to analog video transfer in terms of resolution, but separates the Color and Luminance signals at the source and recombines them on the display or on a video recording. Component Video: Separates Luminance (Y) and color (Pb, Pr or Cb, Cr) into three channels (requires three cables) for transfer from a source to a destination. Component Video cables can transfer both standard and high-definition (up to 1080p) video signals. 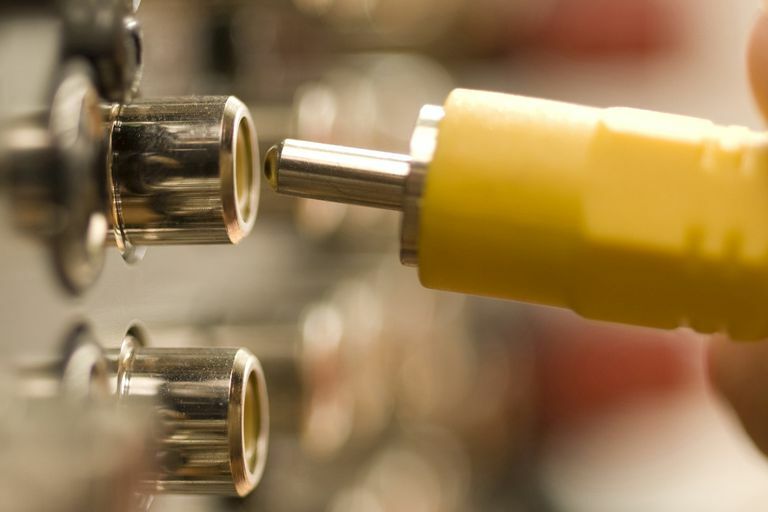 For photo references of S-Video and Component Video connections, as well as SCART, analog stereo audio, and RF coaxial cable connections, check out our Home Theater Connections Photo Gallery.